Ladies and gentlemen, THAT is a narwhal tusk. What is a narwhal, you ask? It’s a sea creature. It is something between a small whale and a large seal. The narwhal has a tusk. It’s actually a tooth gone wild. A front tooth grows like mad and develops into this crazy-long sword. Cartoon images of narwhals show the tusk like a horn, growing out of the creature’s head, but this is erroneous. 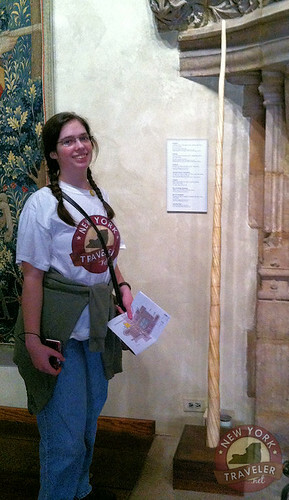 This tusk is at The Cloisters in Manhattan. 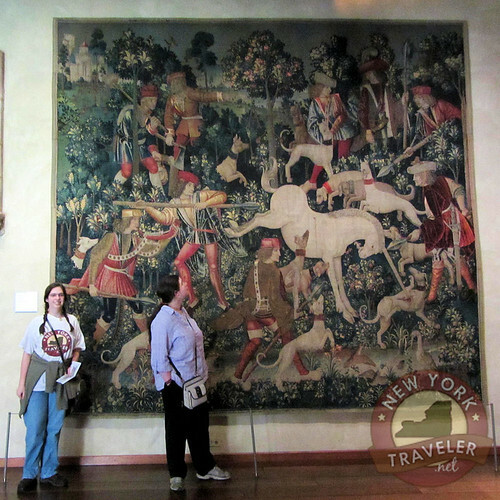 It was on display in the Unicorn Room, a room filled with enormous tapestries of unicorns. HOW anyone can get a unicorn from a narwhal is beyond me. I’ve heard it said that the “primitive” people got mixed up and thought a narwhal was a unicorn. But you tell me. Would YOU get these two creatures confused? So I don’t believe that the people of the past thought that narwhals were sea horses with horns on their heads. I think the unicorn idea is made up, in the imaginations of people, all by their primitive little selves. ← Bad Soil? No Problem! I never heard of that until now, love how you tell us tidbits! Hope you all are having a blessed weekend!! Guess what? Wednesday I hardly talked at all hahaha. I told you that since I did so much talking that the next day I was wiped out. Do they use those tusks for anything? I would imagine that is a buggar to navigate around.